Now Hamilton runs the award-winning Boys and Girls agency in Dublin, creating campaigns for brands like mobile phone network Three, Nissan and Kopparberg cider. Its standfirst promises ‘daringly simple ideas’ and it’s tempting to draw a line between its founder’s first foray into his own self-promotion and the ideals that continue to inspire the agency. When Hamilton and his partners set up Boys and Girls in 2009, they didn’t have a single client, but this forced the founders into thinking creatively about how they were going to get the new brand out there. 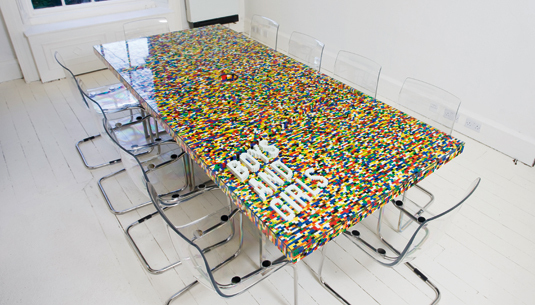 The answer came in 22,742 pieces, which was the amount of LEGO bricks it took to build the agency’s new boardroom table. Photos of it quickly went viral as it was picked up by a host of design and inspiration blogs, and it still crops up regularly on Pinterest and Tumblr. A stop-motion video of the table being assembled has had more than 112,000 views on YouTube. “It worked to get us noticed by the international creative community and provided a home-court advantage whenever any clients came in to see our work,” Hamilton says. For young creatives just about to leave university, or those still trying to break into the creative industries, the pressure is on to find the right way to speak to the right people. A recent study found there were 49,920 students on creative arts and design courses in the UK; add to this all those who study something else before eyeing up a position in an advertising or design agency. In short, competition is fierce. He visited the likes of KK Outlet, Mother London, Wieden+Kennedy and YCN, and made videos capturing the reactions he encountered, which were fairly mixed. And particularly once the videos started to get picked up by the design press, McCallum’s endeavours started to pay dividends. Inspired by his experiences, McCallum has continued to experiment with speculative applications that go beyond the finely crafted cover letter. He visited the Don’t Panic studio and – dressed in a tuxedo – handed over a specially made Poor Man’s Oscar statuette (alongside his CV in a golden awards-ceremony-style envelope). The accompanying video may be pretty awkward, but it worked out – shortly afterwards Don’t Panic offered him a job. “I wouldn’t say we gave George a job because of his stunt, but it certainly persuaded us to give him the opportunity to persuade us,” explains Don’t Panic’s Richard Beer. In an industry based on personal relationships, finding ways to weasel your way into agencies and studios to get face-to-face with the key people has proved a popular self-promotional challenge. 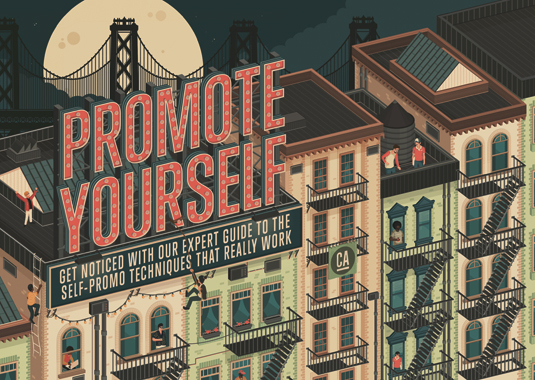 There is a fine line between a smart, memorable and effective self-promo project and an irritating gimmick. Often the latter are those stunts that feel totally divorced from the skills the creator is trying to demonstrate. This was a trap Robby Leonardi was determined to avoid. The New York-based designer who works across illustration, graphic design, animation, and front-end development noticed a trend in his industry for interactive CVs and so decided to create his own. 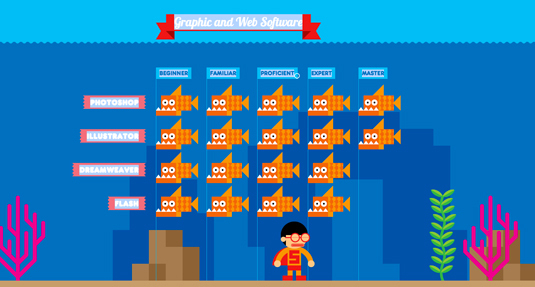 Visitors to Leonardi’s website are able to select either his design portfolio or his interactive resume – the first is a fairly traditional presentation of his work but the second is a tremendous platform game where users navigate a bespectacled superhero through snarling skyscrapers, an undersea kingdom and a hot air balloon ride. Strikingly, Leonardi’s interactive resume ends on a contact page, reminding us that it’s fun but it exists to try and drum up new business. New York-based agency Dark Igloo have played around with their contact page too, turning it into an 80s-style racing game. More recently the studio produced Bored Game, a deliciously weird parody of 80s toy commercials featuring a super-creepy wizard. Karin Langeveld of Dutch design studio Trapped in Suburbia agrees. 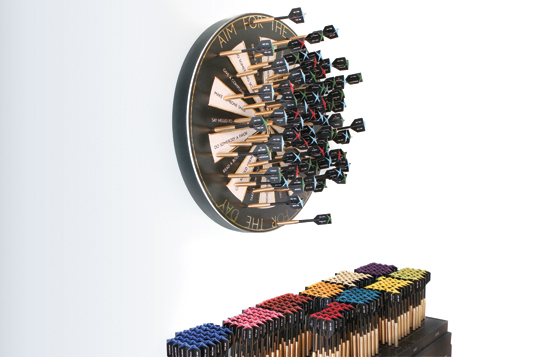 Although it’s a small agency, Langeveld admits that when they are hiring, clever self-promotional work is a real asset. “Client briefs do not aways give you the creative freedom that you’d like, and you need some creative freedom to keep yourself fresh and sharp,” Langeveld explains. For all the clever creative thinking that goes into self-promotional work though, sometimes it’s about seeing and seizing an opportunity, and that brings us back to Rory Hamilton. He gave a talk at the Dublin Institute of Technology, during which he mentioned that the agency enjoyed competitive games of FIFA 2015. After the lecture, one of the students, James Groarke, took to Twitter to challenge him to a game. The deal was that if Groarke could beat Hamilton, he’d be offered an internship, and he even produced a video calling Hamilton out.